This is the official press release for the worlds first LPG powered hybrid car, the Elantra LPi hybrid! Hyundai Motor Co. launched its first Hybrid Electric Vehicle (HEV), Elantra LPI Hybrid, in the Korean market at a press event attended by President Yang Woong-Chul, head of Hyundai-Kia Corporate Research & Development Division, and members of the Korean and international press. “Listening to the voice of our customers, we’ve responded with the Elantra LPI Hybrid which offers fuel saving advantages and minimal harmful emissions. This car offers a strong message of reassurance to our customers and stakeholders that we are moving with “Hyundai speed” to achieve our goal of environmental leadership in our industry and redefining the Hyundai brand as a technological innovator,” President Yang said at the launching ceremony today, which was held at an arboretum outside of Seoul. Elantra LPI Hybrid delivers a fuel economy rating of 17.8 km/l (41.9 mpg) and CO2 emissions of just 99g/km to qualify as a Super Low Emissions Vehicle (SULEV). Because it is approximately half the price of gasoline in Korea, Liquid Petroleum Gas enjoys widespread popularity as a transportation fuel. A conventional 1.6L Elantra equipped with an automatic-transmission would be able to travel a distance of 15 km using one litre of gasoline. If the same expenditure of 1,654 won (US$1.30 per litre, today’s retail gas price) were spent on LPI fuel, the Elantra LPI Hybrid would be able to travel 39 km. The savings add up: Over the course of a year, Elantra LPI Hybrid would result in about 1.35 million won (approximately US$1,100.) in fuel savings compared to a conventional Elantra assuming an annual average driving distance of 20,000 km. This translates into the fastest payback period of any hybrid vehicle on the market today. The fuel efficiency of Elantra LPI HEV is further improved with the engine ‘Auto-Stop’ function which automatically switches off the ignition at idle. This feature only functions when the driver applies the brakes after running the car for more than two seconds at speeds of 9km/h or higher. Under certain pre-defined conditions, however, such as when the battery charge drops below 30 percent or when the accelerator is engaged, then the engine ‘Auto-Stop’ feature will be defeated and the engine will continue running normally. Powered by a 1.6 LPI Gamma engine with maximum power rated at 114 ps and a 15kW electric motor with maximum power rated at 20ps, the hybrid engine of Elantra LPI HEV puts out total 134 horsepower through a Continuously Variable Transmission (CVT). Acceleration from zero to 100km/h is clocked at 11.7 seconds, beating the Honda Civic Hybrid by about 2 seconds. The vehicle’s SuperVision gauge cluster is equipped with an “Eco Guide” tree icon which is designed to coach the driver into developing more economical driving habits. An indicator lights up if the driver is operating the vehicle in an eco-friendly way guiding the driver to avoid sudden acceleration and braking. If the driver is performing well, the tree icon will sprout small green leaves to reward good driving habits. Elantra HEV’s CVT is equipped with a driver-selectable ‘E (Eco-Drive)’ gear that maximizes fuel efficiency by reducing sharp fluctuations in the torque, increasing the use of electric motor assist and electric charge regeneration when brakes are applied. Available in three trim levels, Elantra LPI HEV will be priced at 20.5 million won (US$16,180) for the entry level HDe-I model and will top out at 23.2 million won (US$18,310) for the HDE-III model (prices include consumption tax exemption). 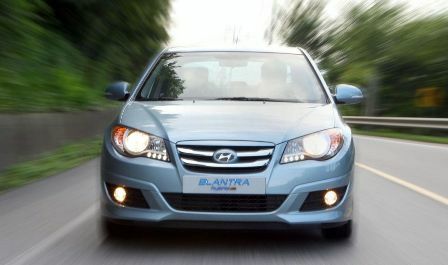 Hyundai invested KW250.8 billion (US$198 million) over a 43 month-long development period on the Elantra LPI HEV.